Accoyo Genetics are some of the finest alpaca genetics in the world. About 50 years ago, Don Julio Barreda began the art and science of selective breeding alpacas in the high mountains of Peru. He carefully culled his herd based on fiber characteristics. He selected only those alpacas with superior finest, heavy shear weights and strong confirmation. Then in the mid 1990's he release a small portion of his herd to be imported to the US. Only 50 herdsires and about 300 dams were imported from Accoyo, Don Julio Barreda's ranch. Today, Southern Iowa Alpacas continues that tradition and raises only high quality Full Accoyo huacaya alpacas. There are now very few, Full Accoyo alpacas in the US. Southern Iowa Alpacas has 19 of them and continues to improve their herd. 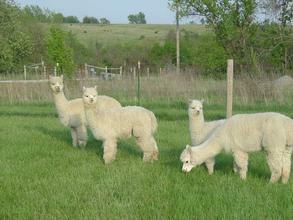 Southern Iowa Alpacas invites you to visit their ranch and see these outstanding alpacas for yourself.